When the down and across angler becomes competent with casting and basic mending techniques the next step in the progression of line control is tension management. When and how you apply tension controls both speed and position of the fly and assists in managing belly in the line, sink tip and leader. Unless you are fishing a vast, expansive flat where current velocity is extremely consistent from bank to bank, standing with your rod low to your side and pointing lazily downstream is just lazy — you are not fishing the river, the river is fishing you. Tension control is achieved through the position and movement of the rod tip. Adding tension will speed a fly and releasing tension will slow a fly. Add too much tension and the fly will rise in the water column, add too little and you induce belly into the swing. Most two-handed anglers use the rod tip very little. 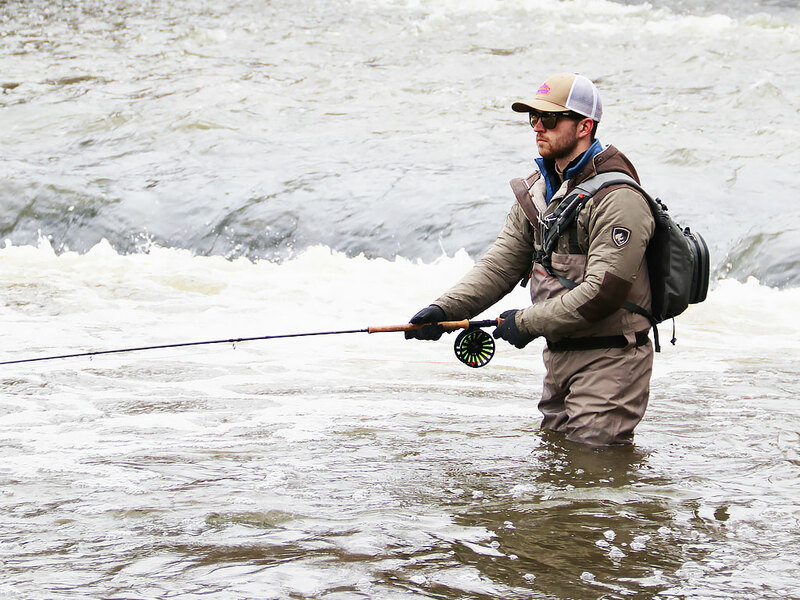 You might see a pull after the cast to straighten a piled leader but even then most just drop the rod to their side and let the current do what it wants to their fly. For Great Lakes anglers who fish volatile runoff rivers that are defined by a wildly meandering thalweg (foam line), if you are not orchestrating your swing with tension management you’re mostly just practicing your casting. You’ll absolutely catch a few fish, but not nearly as many as you could. As you head to the water this season, the following tips will help you start to think about tension and help you gain control of your swing from beginning to end. VISUALIZE YOUR SWING BEFORE YOU CAST: You know where the bucket is. You know where the fish is likely holding. How do you want the fly to pass through the bucket? Broadside? Quartering or tail first? What is the water temperature? Should the fly be moving faster or slower? Make a plan then make it happen. SET UP THE SWING BEFORE YOU FISH IT: Sling and swing is no different that spray and pray shooting. The end result is left to chance. Cast. Straighten the leader. Find your depth and desired arc in the leader (if any) then walk the fly through the bucket. Commit to having control of your swing every step of the way. MOVE YOUR ARMS AND ROD: You have 4-feet of reach and 11-14 feet of rod. Use it for more than delivering a cast. KNOW WHERE YOUR FLY IS: Most anglers have no idea how much line sag and belly shorten their swing. If your tight line cast is landing exactly where you think fish are holding it’s swinging short. The deeper and longer you swing the shorter the swing gets. EXPERIMENT: I know anglers who truly believe mending will kill their swing. While it’s true a bad mend can position a fly improperly it’s equally true that unmanaged line will fish just as poorly. Every cast, every current and every presentation is different. You’re either in control of your swing, or not.